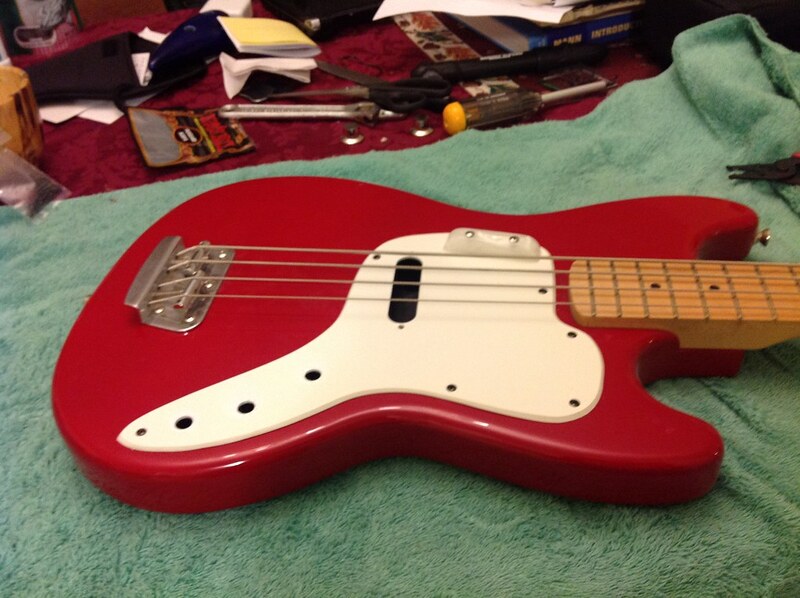 1) Does the Musicmaster bass pickguard fit perfectly/well on the Bronco body? I know that the Mustang bass control plate has a different shape than the Bronco "control plate" and doesn't cover up well the space where volume and tone pots are so I don't want to have the same issues with the Musicmaster PG. 2) honey's suggestions for tuners are a bit expensive and I'd like to put "leaf shape" tuners: could I use the Wilkinson WJBL175CR or WJBL200CR 4-in-line tuners set? They are cheap but with good quality; is there any other "leaf style" tuners set for cheap?. This pickguard fits. Make sure it's the one that doesn't have a tight contour around the neck heel as there are different versions of the musicmaster bass pickguard. This is a bronco I converted. It belongs to Mixtape now. I thought I recognized that Bronco. The pickguard is from WD. The screw hole placement is different, obviously; be prepared to fill in and paint over some of the old ones. I ignorantly ordered a black one with the neck heel contour on eBay a while back, and no, it does not fit. The seller was cool and let me return it, though. Make sure it's the one that doesn't have a tight contour around the neck heel as there are different versions of the musicmaster bass pickguard. Are WDMusic PGs good? I'd like a pearloid one but 70� are exaggerated; is there somewhere a Musicmaster PG plan? It would be cheaper to take a pickguard sheet and make it on my own; as last resort, I could use a white one. And THIS ONE? And how about the tuners? Is one of those Wilkinson good? I don't care if I drill other holes; I saw someone here on the forum that used THESE TUNERS: how are they? I'll wait for an advice on what pickup I should choose. I was just wondering: How much is the shipping cost from WD Music? They have a .co.uk site: should I pay customs duties too? There shouldn't be any customs charges within Europe. The kind you want to avoid on a Bronco bass looks like this: see where it's got a cutout for the neck heel? If you line that up, the rest of the pickguard won't cover the control cavity. The pickguard you linked to, however, should be the right shape. I would like to know as well. They are the only tuners on that site that don't cost more than I paid for the bass.